Would you like to design a plant in 3D? With ESApro 3D piping you can create a three-dimensional model of the plant and generate orthographic views, as well as isometric sketches and material lists. The ESApro Plant Design applications speed up the design process thanks to the constant monitoring by the Piping Spec, and always ensure univocal precision in the choice of the components used. The classes defined on the database can be modified at any stage of the project: the powerful update functions verify and keep the newly created lines up to date and ensure congruency with the new classes. Even unskilled users can easily handle ESApro 3D Piping as it requires just a very basic knowledge of the tridimensional environment. The software contains hundreds of parametrical graphic functions generating the 3D model of piping components by picking up the dimensional data from the centralized database. The ESApro 3D Piping catalog provides more than 10.000 piping components, organized in 1,500 dimensional tables, all conforming to the most widespread standards (such as ASME, ISO/DIN/UNI, BS, BPE etc.).. Beside the conventional components, a catalog of components in PVC and PTFE, fiberglass, sanitary and Victaulic are also available. The graphic representation of the components conforms to the standards of the plant industry; when required it is possible to use customized components directly modeled either with AutoCAD/BricsCAD or other software, or eventually downloaded from the manufacturer’s web site. Such models, once they are saved in the library, behave exactly the same way as the original ESApro’s ones. The ESApro 3D Piping package contains a module for the fast creation of structural steel. Thanks to quick and intuitive interfaces it is possible to create beams (IPN, UPN, IPE, HE, LEQ etc.) by taking them from a customizable database and by adapting them to your own needs simple shaping and editing commands. Besides having a parametrical library of pumps, tanks, heat- exchangers and other equipment, 3D Piping can import 3D solids modeled directly with AutoCAD/BricsCAD or external standard format (ACIS, STEP, SAT etc.) files and also can convert them into ESApro equipment: during the conversion process it is possible to define the connection points to the new equipment, acknowledged by the program as nozzles valid for all intents and purposes. The libraries provided by ESApro 3DPiping include more than 70 parametrical supports (pedestals, collars, shoes etc.) Once they are inserted they can be counted and automatically passed into both the isometric sketches obtained with ESApro Isometrics and into the interchange files generated by ESApro Stress Analysis Interface. The optional ESApro Supports module is available for the development of constructive drawings and exploded material list. Furthermore provides the command “Publish DWFx ESApro” which exports the ESApro model into the DWFx format; the DWFx format can be opened by a free viewer (Autodesk Nawisworks Freedom or Design Review), to navigate the model, inspect objects and take measurements. This advanced functionality streamlines the sharing of information within the company and with the external world, minimizing the need of creating 2D tables and preliminary lists for the contractor. The perfect combination of these two environments make ESApro and PointSense Plant the ideal choice to approach, in a simple and effective way, all the issues related to the management of the expansion and revamping processes of existing plants. The “Publish” command allows the user to transfer all the present in the drawing into the database making this data available to the project team, and in order to create updated lists; thanks to the “Line Manager” tool it is possible to keep the project lines under control in real time giving the process manager the possibility to intervene on process data in a simple and immediate fashion; the “Compare” function allow a constant verification on the congruence between the process scheme and the 3D model. 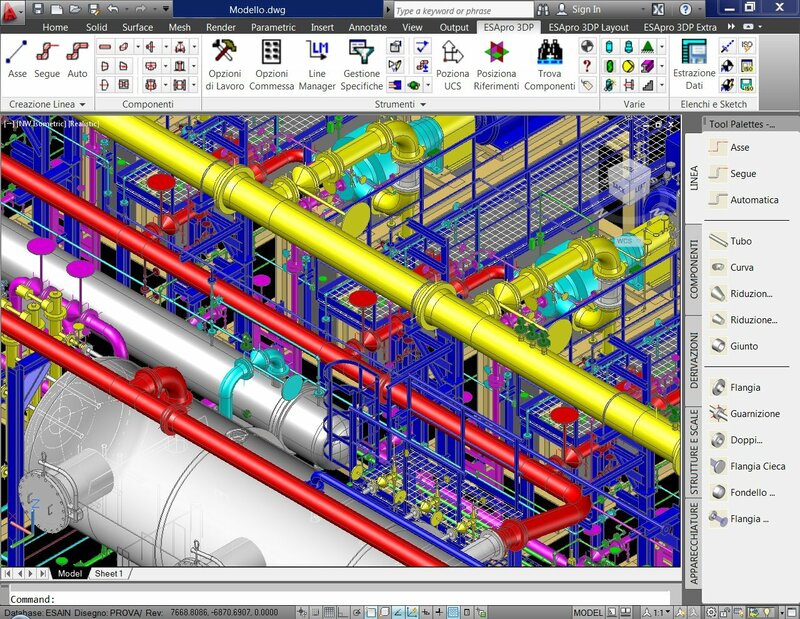 Once the 3D model is finished, ESApro organizes and transfers the piping lines to the ESApro Isometrics module in order to create the isometric sketches. ESApro Isometrics provides a large set of tools for the modifications, final touch-ups, or the addition of notes while remaining constantly connected to the 3D model. The program can directly display a shaded view, of the plant that is very useful when viewing very complex areas. Moreover, when presenting a preview, it is possible to render the model in a very sophisticated way so to enrich it with realistic and impressive visual effects. The software can also make film clips and produce animations.